ART ATTACK. 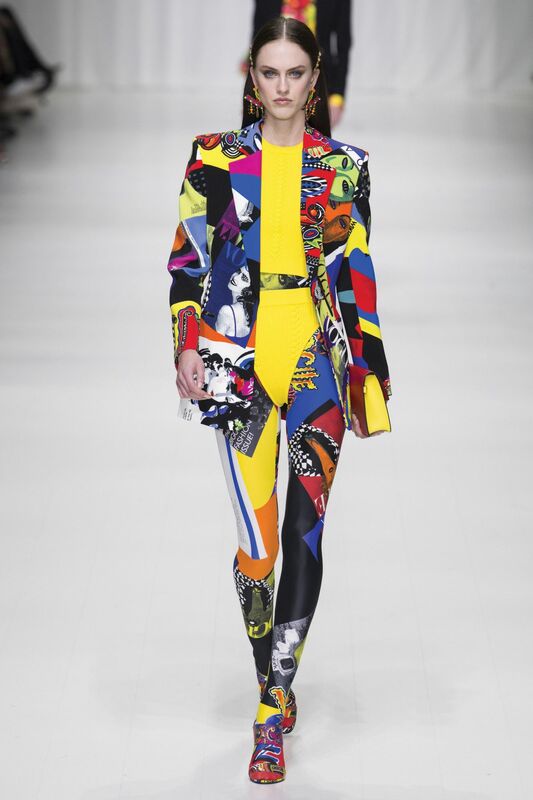 Versace takes a page out of a comic book to give us a dizzying mix of eclectic prints for its spring/summer 2018 collection. PURPLE HAZE. Sunglasses are a must, for spring and summer. Opt for a light shade with retro frames and styles like this one from Stephane + Christian. ULTRAVIOLET. Add a sophisticated touch to your otherwise funky ensemble with Bulgari's latest Serpenti watch in the colour of the year. CANDY CANE. Balmain's high-waisted viscose flared pants hits all the right marks for a groovy night out. PARTY HARDY. Stay on trend with MR by Man Repeller's point-toe pumps printed with the designer's playful heart doodles. PREPPY PASTELS. Forget about neutrals—this season is all about colour blocks to offset busy prints, such as this Comme des Garçon purse. OBLIQUES. Go graphic with Louis Vuitton's V Speedy earrings; wear just one piece for an edgy vibe. LEMON DROP. In keeping with the art theme, Loewe's coveted blinding yellow Puzzle bag makes it to the list. GRAFFITI WALL. This oversized Moschino shirt is meant to be worn as a mini dress. Pair it with ankle boots or kitten heels, plus bright coloured socks to match. FLASHDANCE. The '80s are back with a vengeance! After fanny packs, tube socks, and spandex made successful comebacks, it's high time for the return of the suspended bodysuit, like this one by Diane Von Furstenberg.